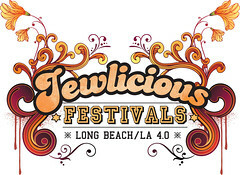 Ladies and gents, believers and gentiles: Once again, it’s time for the Jewlicious Fest in Long Beach, so mark Feb. 29 through March 2 on your calendars. If you haven’t heard of Jewlicious, it’s basically the Woodstock of Judaism, with three days of music, food and Kiddush Wine. A festival for the artist and the curious college student. I like that, thanks OC Weekly! In describing what makes Jewlicious Festival unique, I said to some at LimmudLA this weekend, the participants come as they are and leave inspired and with new friends. I’ll say more about that weekend at LA’s first Limmud – which blew away the expectations of the folks there, the presenters from around the world, and the kids. yes the kids. They had a great kids program- and my kids are really picky on these kids programs. They hate glorified baby sitting. They want interesting things to do and see, and games to play, and ways to help. Limmud Delivered. Did I mention that we have only a few dozen tickets left for Jewlicious Festival? Next Story → LimmudLA: My denominatrix is here!